Seattle is a city with a unique vibe. It is beautiful, vibrant, young and trendy. It’s also edgy and nouveau in a classic sort of way. A coastal city, spread out between Pacific Ocean bays and spectacular mountain ranges, with clean fresh air and banks of colorful seasonal flowers. It embraces both its environments open, natural spaces and thriving urban landscape with a passion. 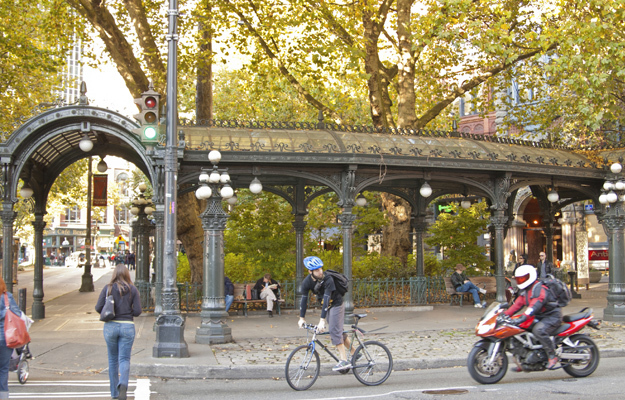 It’s a city rich in culture filled with museums, theaters, and music. Here’s a suggested itinerary to make the most out of a 2-day Seattle visit. 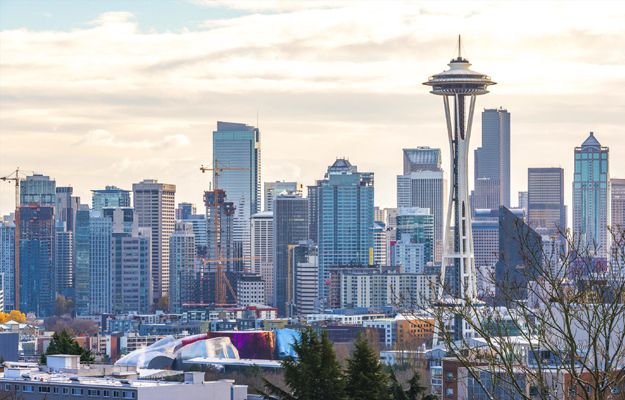 Start out with a great overview of Seattle and see places you would otherwise not be able to see in just two days on the Emerald City Trolley. It’s a hop off/hop on tour so you could get off at any time and have a look around if you wanted, but to see as much as possible in a short time, stay on it for the full loop. Both the driver and the tour guide are engaged in the tour, pointing out all the must-see sites with interesting stories to go with them. The loop tour takes about 1 ½ hours. Allow 2. The first trolley of the day leaves at 9am from Stop 1 in Seattle Center. Get there early. Once you’ve taken one full loop, stay on the trolley until you get to Stop #4 (Aquarium). Hop off. Note: Dress in layers. Seattle weather can be chilly, especially in open air places, like the open-air trolley. There’s a lot to see in the Seattle Aquarium – really cool Pacific sea creatures. On this visit hit the highlights in one hour – Window on Washington Waters,a massive 120,000 gallon tank filled with sea life of the Northwest; Underwater Dome, a 360 degree view of Puget Sound sea life; a virtual trip to the tropics in the Pacific Coral Reef exhibit. Don’t miss the giant Pacific octopus, it’s huge! Before you leave, add a half hour for a quick snack in Aquarium Café overlooking Puget Sound Hall and Window on Washington Water with a great view of Elliot Bay. Argosy Cruise Harbour Tour is a one-hour narrated tour of harbor that departs at specific times. Since time is of the essence, catch the 1:25 trip. 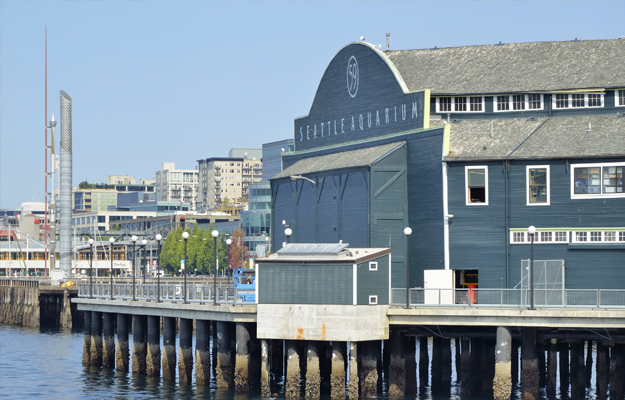 It’s a wonderful way to get out on Elliott Bay, see beautiful views of the city with Olympic and Cascade Mountain ranges in the background, the historic waterfront and busy Port of Seattle. Note: Book ahead. Take the 1:25pm tour. They have a package deal with the Aquarium. If you purchased a CityPass, both are in it. End Day 1 with a super-fun 2-hour treat. Literally. Walk over to Pike’s Market for one of Seattle’s favorite visitor experiences – Savor Seattle’s Food Tour of Pike’s Market. The entertaining, fun and food- filled tours give and insiders look at some of the vendors in the 100+ year old market where the food mantra is FLOSSL – fresh, local, organic, seasonal, sustainable. Enthusiastic tour guides, all market insiders, take you behind the scenes to meet some of the liveliest vendors, hear their stories and taste their specialties. And yes, you’ll see fish fly at Pike Fish Market, see how handmade cheese is made, enjoy the colorful spectacle of fresh produce, have delicious clam chowder, piroshky pastries, and more. Note: Make reservations ahead for the 3:30pm tour, the last of the day. Allow time to get there. Start the day off right, with Seattle’s famous coffee and delicious fresh breakfast at any of the many coffee houses. Chihuly Garden & Glass is a magical place and a visually beautiful place to see the morning of Day 2. Get there at 10am when it opens as you have a lot to see in one hour! To be surrounded by Dale Chihuly’s huge, fabulous, fanciful, surrealistic glass flowers for even a short while is a truly uplifting and mesmerizing experience. Enjoy lunch made from fresh ingredients in Collections Café where 28 works from the Chihuly collection enchant and entertain. For yet another unique Seattle experience, soar over downtown on Seattle Center Monorail for a 1-mile, 2 minute ride to from Seattle Center to Westlake Center Mall. Views are great! Head to Pioneer Square to catch the Underground Tour. Departing on the hour, it’s a fun 75 minute adventure underground, yes, underneath Pioneer Square’s present-day sidewalks where what were once streets and abandoned storefronts of old downtown Seattle lie in dusty darkness. Walking through the rough, underground warren you see it as it was in the rough and rowdy pioneer gold rush era of the late 1800s, far different from Seattle today. On the fun and often outrageous tour you’ll learn how this unusual arrangement of a 2-level city, operating part above and part below ground came about. Make your way back to Seattle Center to spend an hour at the one-of-a-kind EMP Music Museum which focuses on “outside” artistic ideas and risk-taking that drive and create contemporary popular culture. It’s an interactive trip into Seattle’s grunge and indie music scene, pop culture and journeys into the infinite world of science fiction. Nostalgic, intriguing, and thought-provoking exhibits and installations mesmerize and shock. There’s a lot of interesting memorabilia here as well as hundreds of iconic instruments, posters, comics, art, film, indie games, fashion innovation, and stuff way out there in galactic circles. It celebrates the music of Seattle’s Nirvana and music icons like Jimi Hendrix too. If you’re there Thursday through Saturday, stay for Happy Hour in POP Kitchen + Bar. End the Day 2 with a special evening – a trip up Seattle’s singular punctuation in the sky, Space Needle, for a wonderful taste of Pacific Northwest dinner with breathtaking revolving 360 degree views at SkyCity restaurant 500 feet above Seattle. Included is a visit to the Observation Deck 520 feet above the city.